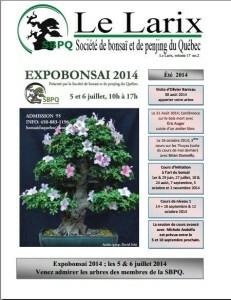 The SBPQ is proud to be able to offer this series of lesson unequalled in Québec. In parteria with ABS (Andolfo Bonsaï Studio) for more than five years, SBPQ gives an acces to those high level courses approaching dufferebt syubject relating to Bonsaï. It give the opportunities to bonsaïka to attain a level of knowledge difficult see impossible to achieve by traditionnal learning. ABS is the italian school of master Michele Andolfo (http://www.andolfo.it/in) wich enjoys a strong internationnale reputation. It is really a big opportunité for members of the SBPQ to be able to follows the courses of this Italien Master here, in Québec! Andolfo lessons are a progression which spreads out on four years and which are composite of eignt lessons (at the rate of two lessons per year). These lessons are constructed to be cyclical, so an interested member can enter the courses at any instant. During those four years, the most important notions, but also the pointed one will be approached. Practical work performed under the supervision of the master will allow you to acquire a strong technical technique. Your vision of this art and its philosophy will also be transform. Lessons are in spring and in fall and are displayed on three days : Both first day being half theoretical half analysis of project in group, the last day is use for practical job on our trees, to apply learnt notions or to move forward personal project under the supervirion of Michele Andolfo and with the collaboration of the other students. All of this take place in a chalet at St-Alphonse Rodriguez, juste beside the nursery Bonsaï Gros-Bec. It is a splendid, ideal place for this activity! Newly constructed, this chalet is equipped with rooms, toilets & showers, a kitchen, a dining room and a schoolroom for theoretical and practical lessons. A great majority of students sleep on place, the atmosphere is very convivial and allows us to create links between us. We can eat there and most part of the time, we cook common meals for supper. It is necessary to know that SBPQ does not make any profit with this activity, which confirm the role of the society which is to promote the art of bonsaï. We devoted ourselves to make sure those high level courses were as much approachable as possible. This way we can form an elite native of Québec who will so be able to transmit this knowledge across all the province. In that way, it is all the world of Québec bonsaï that goes out of it winning. Sébastien Demers is the Andolfo Bonsaï Studio School Representative in Québec, you can contact him just by using the contact us form to get more informations or to reserve your place for the next course. * Being dependent on the exchange rate of the Euro, the prices can vary.